Handcrafted Wooden & Ceramic Multicolor 4 Drawer Box dimensions in cm : H 10.5 W 31 D 10. Weight 1.750 Kg. Packed unit H 15 W 39 D 14 Wt. 2.00 Kg. Handcrafted Wooden & Ceramic Multi-color 4 Drawer Box - This wooden & ceramic multi-color 4 drawer spice box is easy to clean. 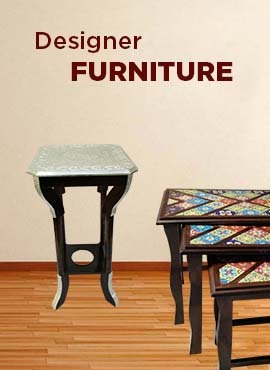 The gift piece has been prepared by the creative traditional artisans of Jodhpur. It has a beautiful multi pattern and with a colorful knob that enhances home decor.